The real sanitization of the past happened when the statues were put up. To correct the record, a museum of Reconstruction should take their place. As the crane hoisted Confederate general Robert E. Lee away from the tall column on which he had stood for 133 years, a cheer rose from the crowd. Watching through the window of my seventh-floor hotel room, I felt a surge of elation as the statue of the commander responsible for the deaths of more United States troops than any other in history was lowered onto a flatbed truck. The long-awaited removal of the monument came as a relief to me—a Southerner by birth, a Southern historian by trade. The monuments had been coming down in New Orleans at a pace of about one per week. Care was being taken not to tip off the public as to where and when the next removal would occur until the last possible moment. When a close friend called to tell me that the P.G.T. Beauregard monument—the third of four slated for removal—was coming down in a matter of hours, I threw my things in the car and raced south from Memphis, where I live, to New Orleans, where I was born. I reached the city a few hours later, shortly before 4 am. I had just missed the removal of the monument of the mounted general, a Creole favorite son who had ordered the first shots on Fort Sumter in 1861. The crowds had already dispersed, leaving only a few dozen cops. They told me that four arrests had been made, one of them an agitated man who had rushed the barricades screaming, “It’s wrong! They can’t do it!” They gang-tackled him and packed him off. Otherwise, it had been fairly uneventful, especially compared to the scene at the removal of the Jefferson Davis statue a few weeks earlier, when it appeared matters might erupt into serious violence between local anti-fascists (“antifas”) and a contingent of removal opponents, many of whom had journeyed from distant locales likes Oklahoma and Arkansas. (The first monument to be removed had been an obelisk celebrating a 1874 coup d’état in the city by a paramilitary organization called the White League.) At the Beauregard removal, however, confrontations had been fairly minimal. In fact, one officer described it to me as a “party atmosphere.” Many people from the neighborhood around the entrance to City Park, where Beauregard stood watch, brought lawn chairs and bottles of merlot to observe the proceedings. Many of those who complained about the pro-removal forces tearing apart “our” city fled to the suburbs decades ago. That first night in New Orleans, I met with a small group of cheerful young antifa activists at a tavern in the neighborhood of St. Roch. None were willing to give their names for attribution, however, because some had already been harassed by angry right-wingers. Many were the victims of doxxing operations in which their identities were revealed online. According to the right-wing smear campaign, these anti-monument activists were on the payroll of Mayor Mitch Landrieu and other “evil, well-funded outside forces” (as one pro-monument leader later put it to me). “I’ve been waiting on my check for months, and I’m starting to get pissed,” one of them joked. Later, Quess Moore, one of the leaders of the grassroots African American–led coalition Take ’Em Down, which spearheaded the push for the removals, told me that he’d been accused by one local radio shock jock of being on the payroll of George Soros. “I had to go look up who Soros was,” he said. On the morning of Thursday, May 18, less than 36 hours after the Beauregard removal, signs of activity began appearing around Lee Circle just downriver from the Garden District. Police officials milled about as barricades were dropped off and no-parking signs went up. I expected to see a swarm of well-armed neo-Confederates descend on the monument. Instead, there was only a weatherbeaten woman from Florida marching about waving a Confederate battle flag, and a thin, bald man in a bright yellow Spandex body suit with the Stars and Stripes wrapped around his shoulders. He said he was there to raise awareness of opioid abuse. The action picked up that night. A few dozen grim-faced military-clad removal opponents stationed themselves at the top of one of the four sets of stairs leading to the 60-foot column, where they were aggressively confronted by local activists. Later, one daring antifa woman snatched one of their flags and took off with several men in hot pursuit. For the most part, though, the atmosphere was less a showdown and more a bacchanal, with dancing and beer and a diverse crowd of a few hundred people milling about—not an unusual scene for nighttime New Orleans, except for the klieg lights, barricades, drums, shouting, and clouds of smoke. The removal process commenced the next morning. 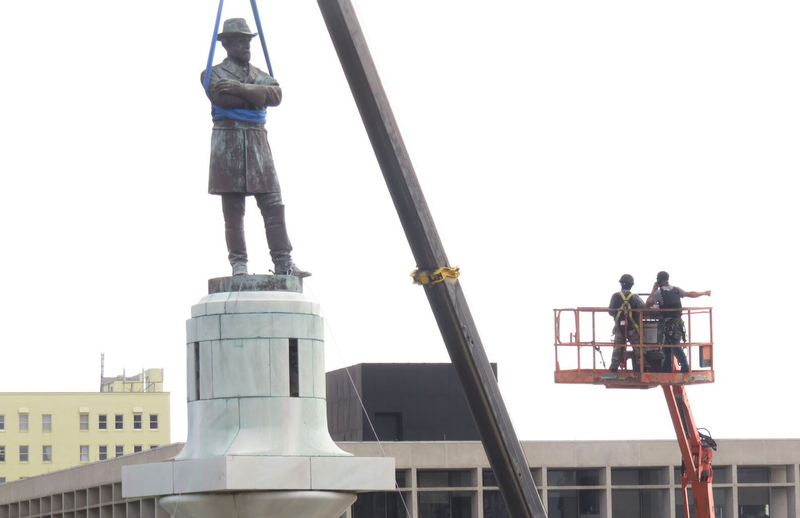 Two men in a cherry-picker spent much of the day strapping in the 16-foot bronze statue, while a large crowd gathered on the periphery of the roped-off area. After a few hours of frustrated whacking on the bolts that kept the statue attached to the pedestal, General Lee finally achieved liftoff and swung into the humid Southern air. Before leaving Memphis, I had looked into what my fellow historians had been saying about recent monument controversies. Most agreed that the turning point had been the Charleston massacre carried out by a young white supremacist in the summer of 2015. Those horrifying murders had led to the prompt removal of the Confederate battle flag from the grounds of the South Carolina state capitol. Then local activists across the South began protesting statues of figures like John C. Calhoun—“the Marx of the master class,” as Richard Hofstadter described him—and momentum for removal began to build in New Orleans, which has a majority-black population. Activists had been agitating for decades against the city’s most prominent monuments to Confederate heroes, all of which had been originally constructed more as paeans to aggressive, triumphant white supremacy than as homages to the figures themselves or as tributes to some vaguely defined “Southern heritage.” It was an important first step toward a true reckoning of the South with the Confederate legacy, but at the same time it was hard not to reflect on the fact that even if the monuments were removed, the men themselves—Lee, Davis, Calhoun, and their ilk—would remain firmly ensconced in the region’s pantheon. They are heroes in the curricula of many schools and private “academies” in the South, where de facto racial segregation still exists and where recent polling indicates that most K-12 teachers believe “states’ rights” to have been the main cause of the Civil War. Soon after the Charleston rampage, professional historians began to articulate a stance that gradually became their discipline’s default position. They argued that we should not take down Confederate monuments but instead leave them up and “contextualize” them with revised plaques explaining their genesis and symbolism. Then we should put up new monuments to heroes like Denmark Vesey, Harriet Tubman, and Martin Luther King Jr. This became the conventional wisdom in the profession, whose practitioners are often prone to self-reinforcing consensuses. Most historians tried to steer clear of these battles, however, and that was true even of those who lived in cities consumed by fights over Confederate monuments. Jumping into this politically charged fray was simply “a no-win proposition,” I heard from one of them, a decades-long resident of New Orleans and a veteran of community activism and support for civil rights. In a 2015 essay in The Atlantic, historians Ethan J. Kytle and Blain Roberts worried that monument removals were an act akin to “sanitizing the past,” a phrase I also heard used by removal foes in New Orleans. But for Take ‘Em Down leader Quess Moore—a soft-spoken writer and educator—the real sanitization of history took place when the monuments were constructed in the first place. They trafficked in a blatantly “false narrative,” Moore told me, one embraced by subsequent generations of white Southerners—a “trickle-down mythology of slaveholder success” passed down through the years. Indeed, many of those who complained about the pro-removal forces tearing apart “our” city actually fled to the suburbs decades ago, most notably to Metairie, an unincorporated area in adjacent Jefferson Parish that is 75 percent white. Public memorials always reflect class and political power. It is revealing, for example, that there is not even a plaque marking the former Mechanics’ Institute in downtown New Orleans, the site of a racial pogrom in 1866 in which enraged Confederate veterans attacked a biracial state constitutional convention. This massacre was among the most significant events of the early Reconstruction era and helped build support for the 14th Amendment. Scott P. MarlerScott P. Marler is associate professor of history at the University of Memphis and the author of The Merchants’ Capital: New Orleans and the Political Economy of the Nineteenth-Century South (Cambridge).